ALAMPUR BANESHAN IS CONSIDERED ONE OF THE FINEST DESSERT MANGOS OF NORTHERN INDIA. THIS MID SEASON BEARER IS ANOTHER &QUOT;CONDO MANGO&QUOT; VARIETY THAT CAN BE MAINTAINED AT A HEIGHT OF JUST TEN FEET. 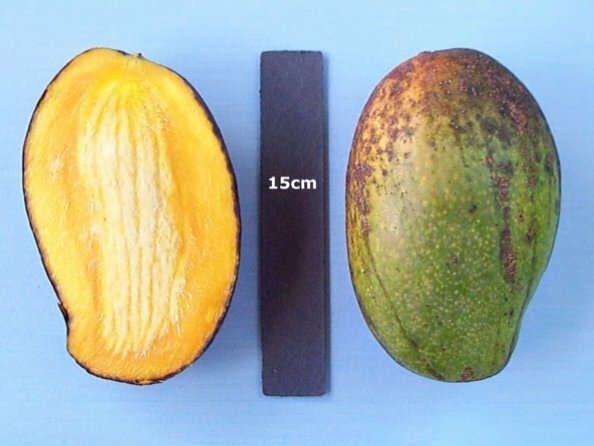 THE FRUIT ARE OBLONG WITH A GREEN SKIN AND DISTINCTIVE CORKY DOTS THAT COVER THE FRUIT'S SURFACE EVEN WHEN RIPE. THEY ARE BEST HARVESTED MATURE GREEN AND RIPENED AT ROOM TEMPERATURE LIKE THE MALLIKA. THE FRUIT TYPICALLY WEIGH ABOUT 1 LB AND RIPEN MID-JUNE TO JULY.